Montejaque is surrounded by many natural parks so is very attractive for sports lovers in all areas. Cycling and road biking can be enjoyed in a relaxed way as many good secondary roads with little traffic wind through the parks from village to village. Visit www.cycleronda.com for more information. Rock-climbing, abseiling, pot-holing and caving can be experienced in the fantastic “rocky” mountains in this area. Visit www.pangeacentral.com for more information. Hiking, tramping, mountain-biking and running through the Sierra’s gives you the opportunity to do sports in a quiet and beautiful surrounding. Birdwatching is a major sport in the mountains due to the big variety of birds, owls and vultures that visit and live in this mountainous province. You may occasionally spot mountain goats, deer and wild boar with your binoculars! Visit www.rondamountains.com for more information. Canoeing and other water-sports can be found on the big lakes near Zahara, Ardales and Algar. Fishing is possible in the rivers and streams which cross the parks. Speleology is very famous in this rocky area. 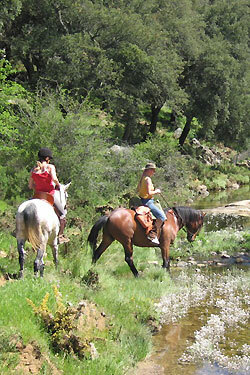 Besides these sports you can also join in on horse-riding, hunting, ballooning and hanggliding. Ask Rob and Coby for more information.